The 2Five makes getting from school to practice and back home more efficient and more fun. The 4-passenger 2Five™ does family travel in master-planned and gated communities. 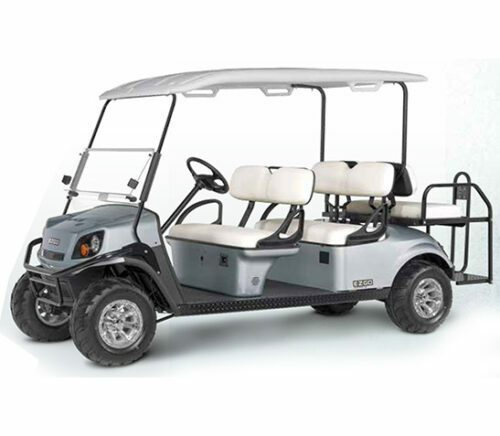 The 4-seater Magellan by Star is a golf car with a powerful 6 HP AC motor, a Curtis controller, independent suspension at the front and an advanced braking system that makes the ride comfortable as well as fun. Spacious and plush interiors as well as its bright, vibrant colour options will only add to your golfing experience. As if all these attributes weren’t enough, its eight 6V batteries allow for a 60 mile long ride with only a single charge! 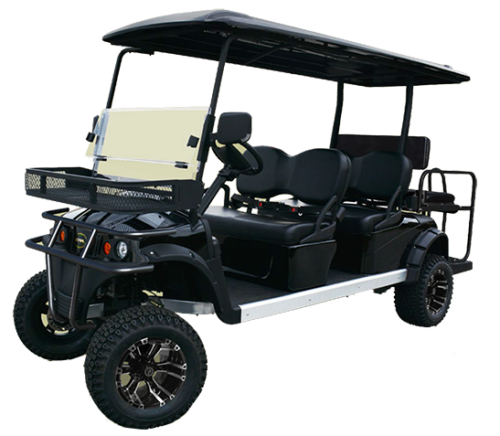 The Magellan by Star EV is a compact yet sturdy and powerful golf car that comes with a 6 HP AC motor and a 48V battery system that allows for a 60 mile long ride on just a single charge. The technological specifications aside, the Magellan 2-AC is a built with a modern trendy sense of fashion that combines comfort with panache. A cruise in this posh automobile is sure to make the onlookers visibly jealous. 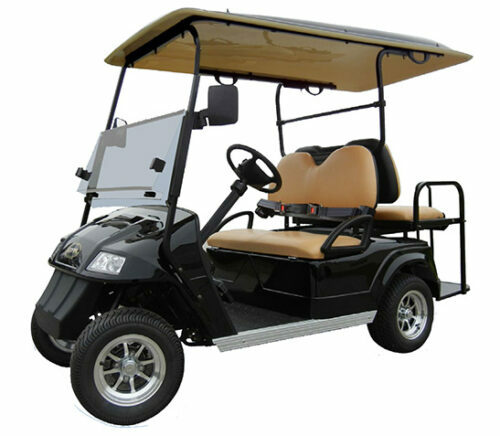 The Magellan 4-AC is an elegantly designed golf car with a seating capacity of 4 persons. The car is spaciously built and comes with a powerful 7 HP AC motor engine and a 48V battery system. The lights are positioned with finesse while colour matched roof only adds to the grace of the vehicle. The modern and technologically advanced panel and the multiple upgrade options available make sure that the Magellan 4-AC will never go out of fashion. The 4-seater Sport by EV is a powerful beast of a car with a 7 HP AC motor. The Sport comes with a generous ground clearance and a sturdy chassis which makes it an excellent vehicle to cruise around in all terrain. 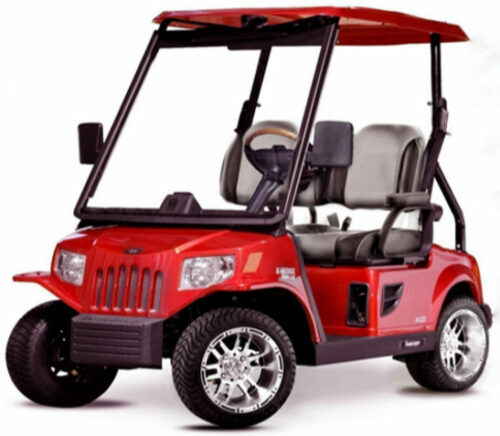 The fashionable LED taillights and turn signal mirrors along with its advanced speedometer, odometer and battery indicator give this sporty all terrain vehicle a touch of modern technology and design. 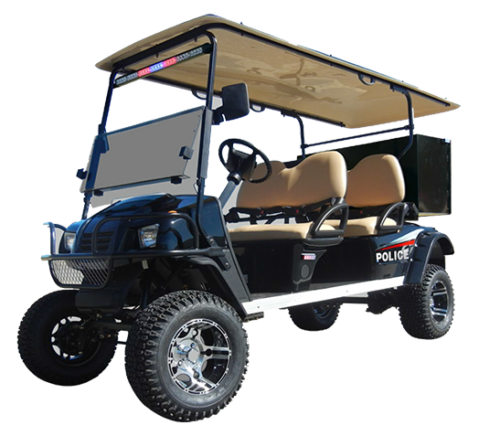 The Sport 48-2-Police is an off road enforcement vehicle that is best suited for patrolling through the rugged terrain within the community. This 2-seater patrol vehicle comes with a powerful advanced DC motor engine as well as a Curtis controller for regenerative braking, specifications that always come in handy, whether you’re doing a peaceful recon or going around chasing the scum of the society. 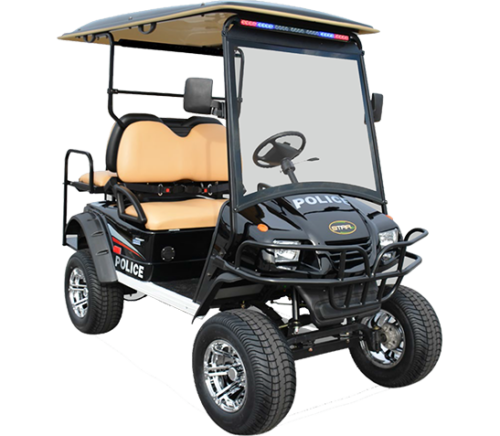 The Sport 48-4-Police is a spacious all terrain enforcement patrolling vehicle that comes with a seating capacity of 4 persons. Its brilliant ground clearance, 12” steel wheels and sturdy assembly allow the vehicle to go off its road trail, if need be in the middle of a chase. Its ample passenger capacity means that the enforcement team can carry its backup along with itself. The Diablo 4+2 is a 6-seater by Star that is extremely stylish as well as powerful, quite like El Diablo himself. 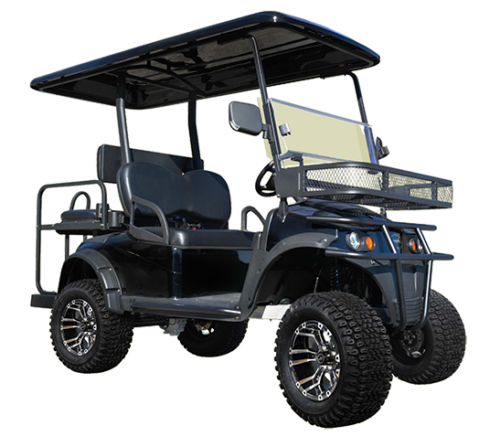 The aluminium chassis, side rails and black powder coated stainless steel brush guard give it a smart dashing look while its 5kW AC motor and eight 6V batteries give it enough power to ease through difficult terrain. Front independent suspension and hydraulic disc brakes make the ride as much fun as comfortable, making it truly eligible to be the Devil’s favourite ride. The Diablo 4+2 Police is a comfortably spaced 6-seater law enforcement patrolling vehicle that comes with a 5 kW AC motor engine and a top speed of around 20 mph. Its strong aluminium chassis, front independent suspension, 12” machined black wheels and hydraulic disc brakes provide the much needed comfort and style to patrolling. With a name and specifications so powerful, nothing speaks authority quite like the Diablo 4+2 Police. The Roadster 2+2 AC is a complete family vehicle with a grand vintage look to it. The chic interiors and ample front hood storage space make it the perfect companion for picnics and outdoor gatherings. 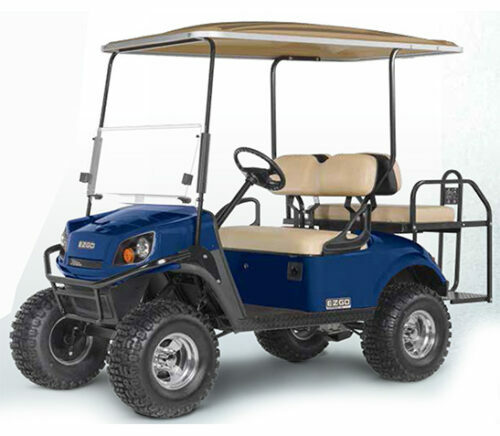 Its powerful 7 HP AC motor, rack and pinion steering as well as its hill climbing ability allow for easy manoeuvrability so that your gatherings can be arranged even in the most difficult yet stunning beautiful terrain. There isn’t quite a vehicle like the Roadster 4+2 AC if you wish to impress your friends and family with vintage style elegance and comfort. Add to it the power of a 7 HP AC motor as well as a large hood trunk to store your luggage and you’re looking at the complete family vehicle that will give you the feel of royal luxury. Not only is the Roadster 4+2 AC styled with a grand retro look, the on-road as well as off-road manoeuvrability and hydraulic braking system mean that safety will never again be an issue of concern. 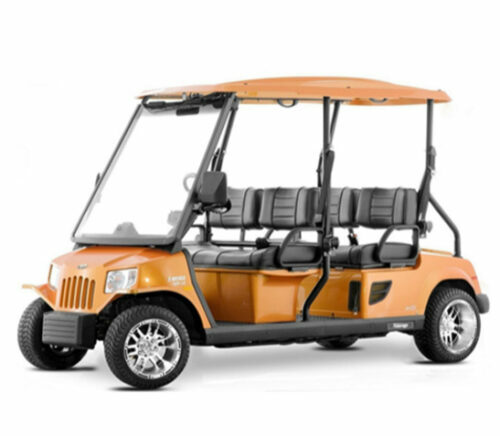 The Gem E4 is a 4-seater golf cart designed by POLARIS that comes with a chic urban design and is spaciously built with comfortable bucket seats and ample leg space. The Gem E4 is easy to drive through the streets and comes with top-end safety and lighting features that allow you to enjoy your driving experience through scenic locations, cruising in comfort and with an urban grace. The Gem E6 is a spacious automobile with a capacity of 6 passengers who can be comfortably seated in its stylish bucket seats. The car has adjustable front seats, ample leg space and under-the-seat storage capacity, leaving no space constraints in its building. The Gem E6 comes with a handy steering and top-end safety features that make for a hassle-free ride around town. The Gem E6, quite like its name, is truly a gem of a car. The Gem eL XD is a powerful cargo carrier that is sturdily built with a payload capacity of 1400 lb. It comes with a powerful 8.7 HP motor that does not compromise speed with payload capacity, customizable carrier and bed options as well as an effective ground clearance which makes it the ideal automobile to carry your workload around wherever you go. The elegantly built Gem eL XD allows you do all of the above effortlessly and in grand style. The Classic 48-2 SS Limited is a 2-seater golf vehicle that is truly built to enhance your overall golfing experience. 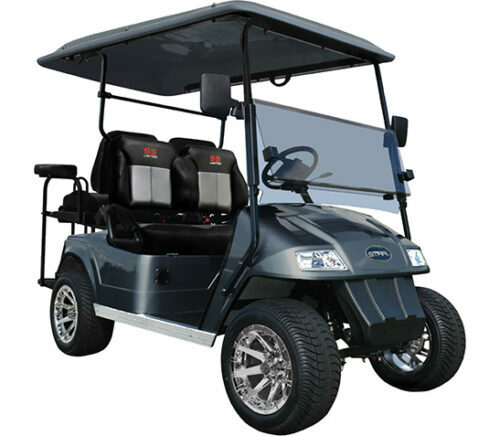 With its stylish design, sturdy build, comfortable seating, powerful 5.5 HP DC motor and efficient 48V battery system, the Classic 48-2 SS Limited is exactly the car that comes to your mind when you think of the perfect golf cart. The numerous technologically advanced features as well as the multiple add-ons available make the Classic 48-2 the golf car to go for! 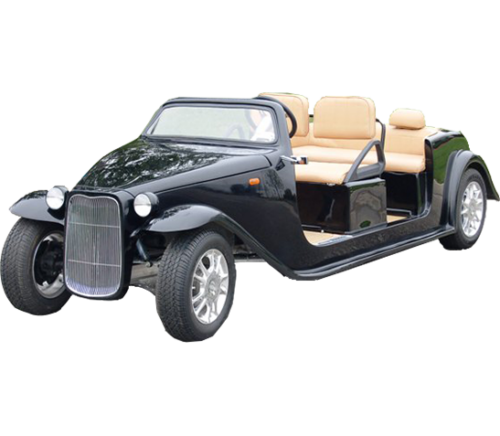 The Classic 48-4 SS Limited is a 4-seater golf vehicle that comes with modern features such as dual toned colour complementary seating, stylish 12” chrome wheels, rocker panels and side rails. The car has multiple options available for optimum comfort and luxury such as an AC upgrade system, a radio and CD player with MP3 input and plush carpeting throughout. It truly is a limited edition car! The Classic 48-2 is a 2-seater golf vehicle that is truly built to enhance your overall golfing experience. 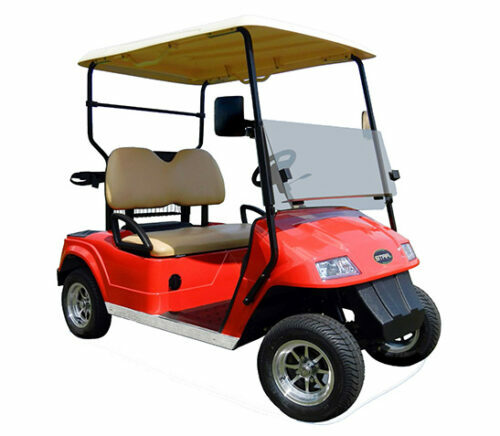 With its stylish design, sturdy build, comfortable seating, powerful 5.5 HP DC motor and efficient 48V battery system, the Classic 48-2 is exactly the car that comes to your mind when you think of the perfect golf cart. The numerous technologically advanced features as well as the multiple add-ons available make the Classic 48-2 the golf car to go for! 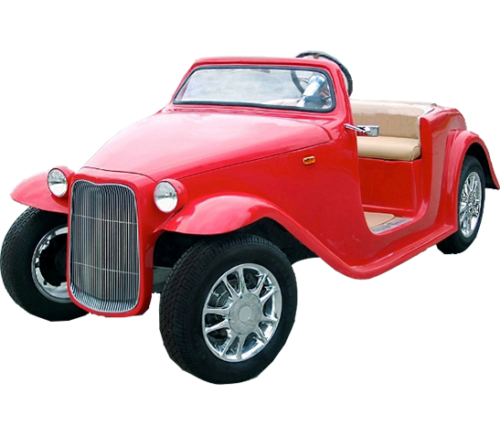 The Classic 48 2+2, quite like its name, is a classic golf car that comes with features such as 10” Aluminium wheels, turn signals as well as front and rear bumpers. With a capacity of 4 passengers (including the driver), the Classic 48 2+2 has ample of space. The car has multiple upgrade options which only make the experience more comfortable and stylish. The Classic 48-4, quite like its name, is a classic roomy 4-seater golf vehicle that is built in an ultra modern fashion and equipped with the latest trends in comfort and style. The car comes equipped with multiple features such as four cup holders in the front and a golf bag holder in the rear. The Classic 48-4 is available in cool trendy colours like almond pearl, metallic silver, metallic green as well as many others. The Classic 48 4+2 is a spacious golf car with a capacity of 6 passengers, a larger version of the Classic 48 2+2. The car has a powerful advanced DC motor as well as controlled regenerative braking and its stylish interiors make the ride an enjoyable and comfortable experience. The Classic 48 4+2 also has upgrade options like a lockable glove box and an AC system, to name a few. 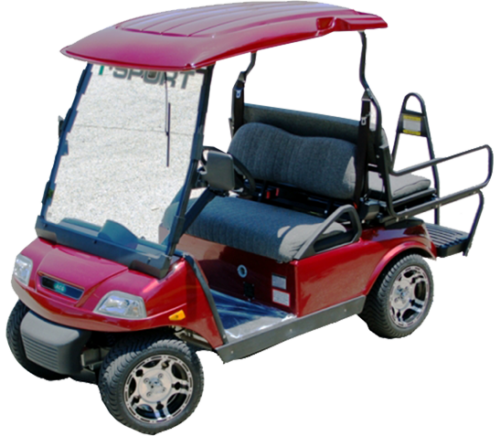 The Classic 48-6 is a spaciously built 6-seater golf car that comes with a powerful 5.5 HP advanced DC motor and a 48V battery system. The car takes care of all aspects of your driving experience including comfort and safety with its comfortable seating, 10” aluminium wheels, hydraulic braking system, front and rear bumpers as well as an option of an AC upgrade. 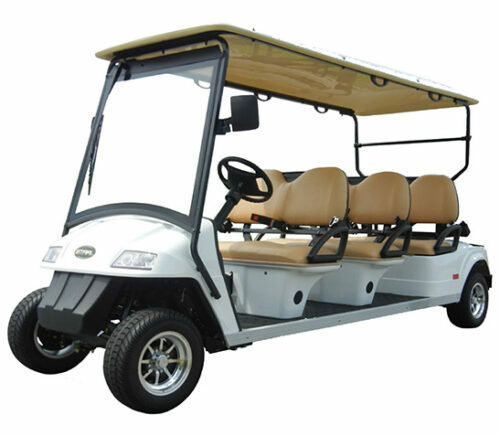 The Classic 48-6+2 is a mammoth of a golf car with a seating capacity of 8 persons. The car however does not compromise on space, style or comfort with a plethora of accessories and advanced system specifications such as a powerful DC motor, aluminium wheels, automatic battery charger and functional front and rear bumpers. The Classic 48-6+2 is a classic example of what happens when technology meets trend to form a complete package of a vehicle. 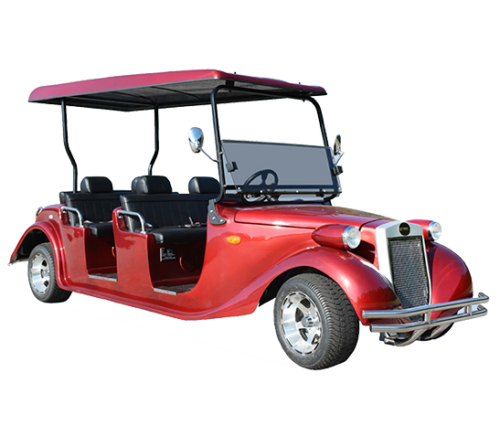 The Classic 36-2+2 SS Limited is a posh trendy golf car that comes with a powerful 4 HP advanced DC motor and a Curtis controller with the ability of regenerative braking. The chrome panelling, handy technological upgrades and stylish metallic colours mean that you can cruise around in comfort and style while heads turn around in awe and envy. The Classic 36-2 SS Limited is a 2-seater golf automobile that is fashionably built and comes with a sturdy aluminium chassis that guarantees safety along with style. The powerful motor provides a top speed of 18 mph while its chrome accessories and plush carpeting give you a feel of sophisticated royal luxury that is anything but archaic. The Classic 36-2 SS Limited is elegance and new-age technology all combined into one. 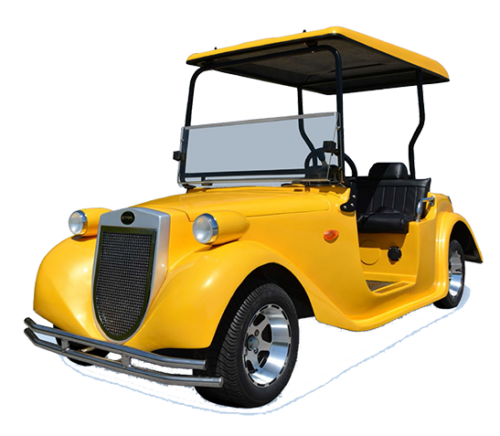 The Classic 36-2+2, quite like its name, is a classic golf car that is powerful and modern in its performance and styling. The car has a host of stylish and technologically advanced features along with a mighty engine and efficient battery system. The numerous features of the Classic d36-2+2 allow for a comfortable cruise while its multiple customizable upgrade options are quite like the icing on a cake. The AP 48-04 is a modern stylish 4-seater automobile that is spaciously designed for extended comfort and leisure. The car comes with a 7 HP AC motor and eight 6V batteries that power it up for a long drive. The AP 48-04 has a technologically advanced hydraulic and regenerative braking system which provides for safe driving even at its top speed of around 20 mph. With the many upgrades available, the car makes for a storehouse of fun and entertainment. 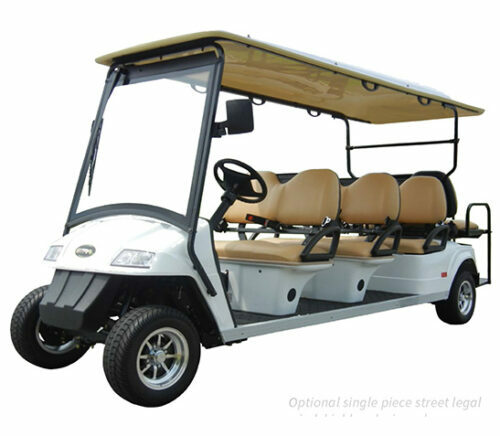 The AP 48-06 is a spacious 6-seater golf car that is designed for optimum comfort and luxury. The car has a Herculean engine and efficient battery system along with features such as high-back seats and front suspensions for a pleasurable drive. The rack-and-pinion steering makes for easy handling while its adjustable armrests and backrests provide the utmost comfort while cruising around town. The AP 48-04-D is a fashionably designed 4-seater golf automobile with ultra modern looks and technologically advanced accessories that perfectly complement its looks. Although the car comes with four doors, there is ample space inside which does not leave the passengers inside feeling cramped for space. To add to the experience, the AP 48-04-D comes with a deluxe stereo, two speakers and a CD player that provides you with complete entertainment on the go. 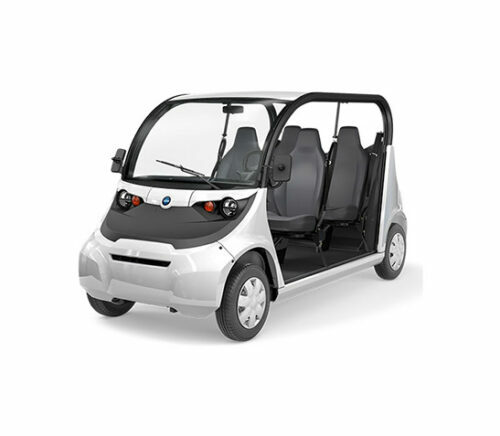 The AP 48-06-D is a golf automobile designed by Star EV that provides you with ample space to shuttle 6 passengers in one trip. The trendy design of the car does not compromise with comfort and luxury, providing state-of-the-art seating and entertainment options. The AP 48-06-D has 6 doors for easy access and is powerfully built with a mighty 7 HP AC motor as well as a 48 V battery system. If you’re planning a short trip with your immediate family, you can be sure of a complete family experience with no one being left behind. The BN72-08-AC-Autodrive-M is a modern sophisticated shuttle bus with a carrying capacity of 12 persons. The bus comes with a beastly 10 HP AC motor as well as the capability of power steering and regenerative braking to make your journey an enjoyable experience. Whether you’re transporting your guests or your friends, the automotive tires and the hydraulic braking along with its top speed of 18 mph, all make it the ideal transport automobile. The BN72-11-AC-Autodrive-M is a 12-seater shuttle bus with a trendy design that includes stylish 13” aluminium wheels, roof mounted dome lights and power steering along with automotive tires. The bus even comes with multiple upgrade options such as side step plates, Sunbrella enclosure and even solar panels to top it all. Now wherever you go with your troupe, travel in style. The BN72-14-AC-Autodrive-M is a shuttle bus with an ultra modern design and a large carrying capacity of 14 persons. The interiors are spacious with stylish accessories such as roof-mounted dome lights and 2-point seat belts while the powerful 10 HP AC motor, Curtis controller and power steering allow for an extremely smooth ride. Also, the bus has a top speed of around 20 mph just in case you’re in a hurry to reach your destination. The BN72-23-AC-ADS-M is a huge spaciously built shuttle bus built by Star EV with a mammoth carrying capacity of 23 persons. The bus has a powerful motor and a 72V battery system that allows its trendy stereo and PA system to play without interruption. 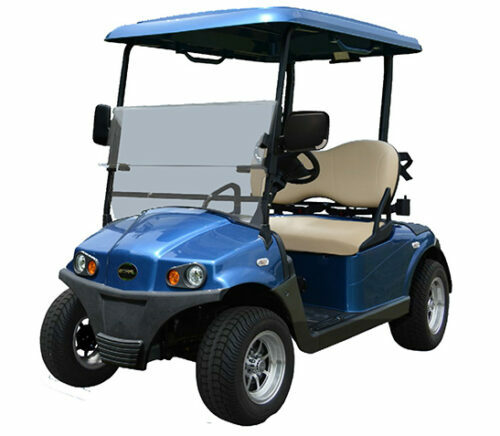 The fashionably built LED signalling system and 15” steel wheels mean that your entire group will blend in with style and authority wherever you go. The BN72-11-AC-H Wheelchair Accessible is a shuttle bus that is built keeping in mind style, space and comfort. The bus has a carrying capacity of 11 persons along with extra space for a wheelchair for the differently-abled, sick or elderly. The bus has been built keeping in mind the needs of such people and comes with wheelchair-friendly accessories such as an access ramp and safety locks. 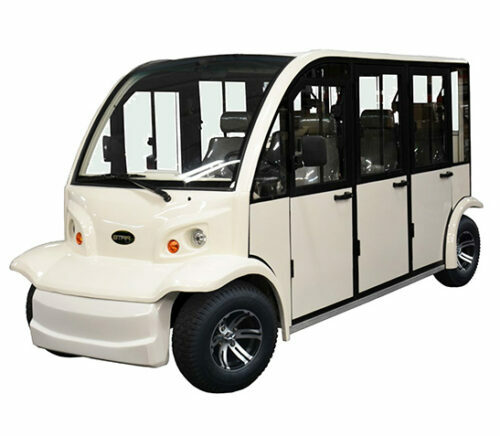 The BN72-11-AC-D-M Wheelchair Accessible is an enclosed shuttle bus built by Star EV with a modern stylish and sturdy design. The bus has door access on all sides and has been built keeping in mind the needs of wheelchair users. 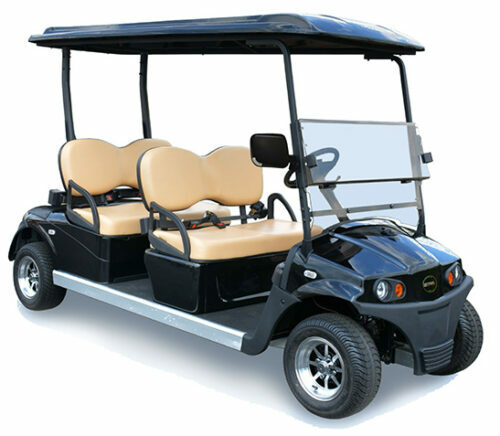 It has a passenger capacity of 11 persons along with a wheelchair and a manual aluminium wheelchair accessible ramp. The solar panel upgrade makes the bus one of the most sensibly designed vehicles ever. 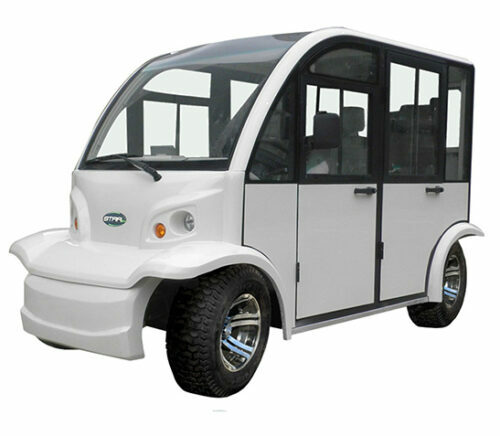 The BN72-14-AC-D-M is a modern shuttle bus that has been built by Star EV with strength, durability and fashion in mind. The 14-passenger carrier has a powerful 9.5 HP AC motor along with rack and pinion steering, Curtis controller as well as automatic drive capability for easy manoeuvrability. 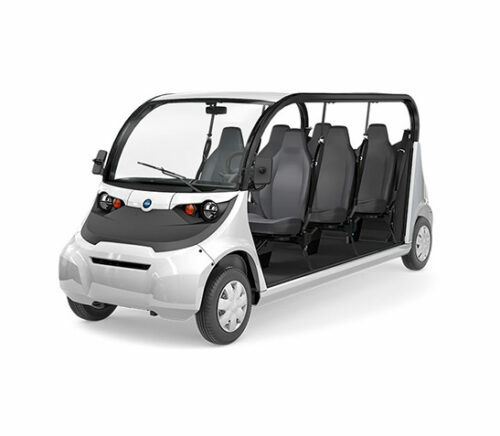 The bus has a top speed of 19 mph, aluminium doors, rust proof chassis as well as stylish signalling panels to provide the complete shuttle experience. The Classic HD Series is quite probably the flagship series of automobiles built by Star EV. The automobiles are comfortably and spaciously built, while making sure that each one is as stylish and efficient as the other. The powerful engine and battery system apart, the Classic HD Series comes with a host of features such as the 12” steel wheels and an automatic charger to provide you a complete vehicular experience. 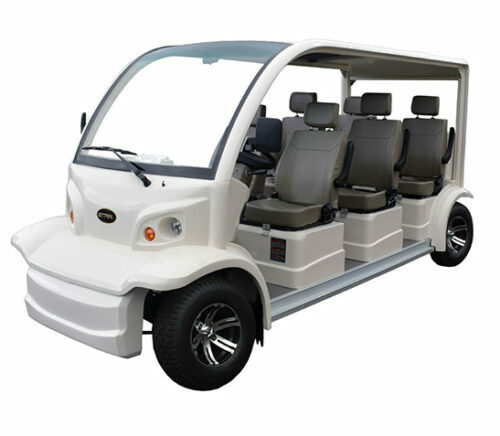 The Classic 48-6 Wheelchair Accessible is a well designed 6-seater automobile that has ultra modern features with a powerful engine, efficient battery system and stylish looks to give you a complete package. Add to this a sense of responsibility towards the wheel-chair bound with its custom wheel chair ramps, side rails as well as safety locks and we have an absolute winner of a vehicle here! The AP48-06-Police and the AP48-06-D-Police are spaciously built 6-seater patrol vehicles designed by Star EV especially for the law enforcement officers. 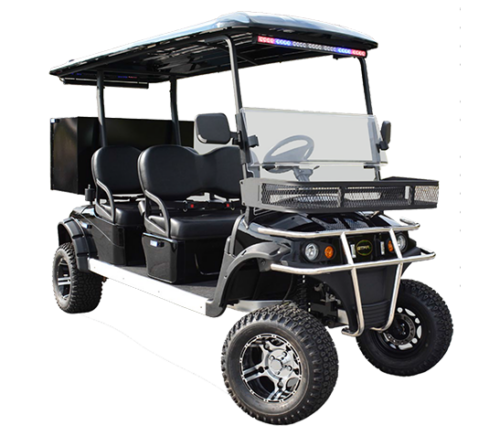 The vehicles comes with a powerful engine and an efficient 48V battery system that allow you to cruise at a top speed of around 20 mph and car accessories such as the special police package which include an amber strobe light along with a PA system. The large seating capacity means that the patrolling can be done by the entire team together. The T-Sport Cargo is a sturdy and spaciously built automobile by ACG that comes with a powerful AC motor and an independent front suspension for a smooth driving experience. The car has a trendy signalling system, a colour matched roof and 12” aluminium wheels along with a with a flip back rear cargo set so that space and style constraints will never again be an issue. 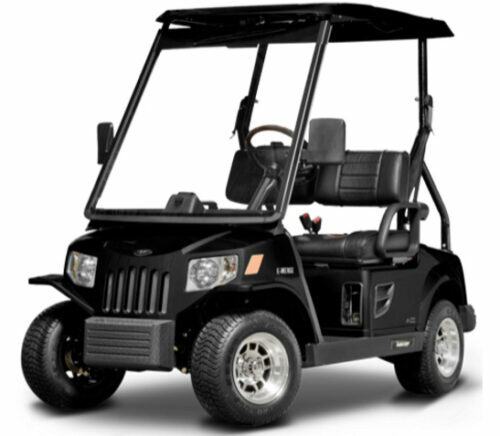 The Fleet TXT by E-Z-GO is a golf car that comes with a powerful engine and stylish interiors to make your golfing experience an extra special one. 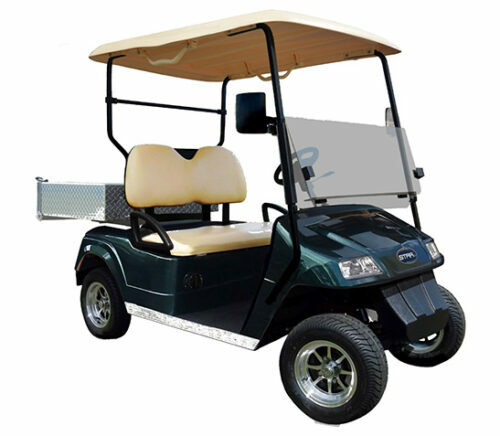 The cart comes with advanced features and specifications such as customizable TruCourse technology, comfortable and spacious seating, a sun canopy with a unique drip edge as well as an optional USB port. 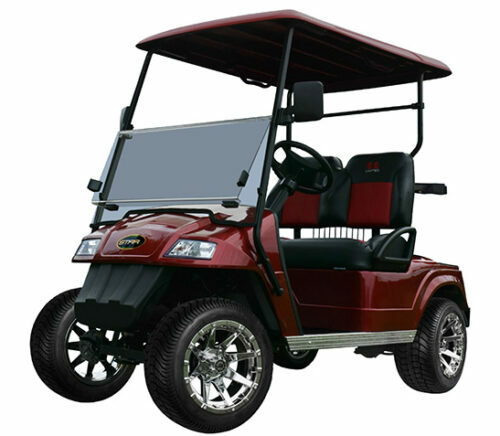 The Fleet TXT is a complete golf cart that you can depend upon every time you go out to play. 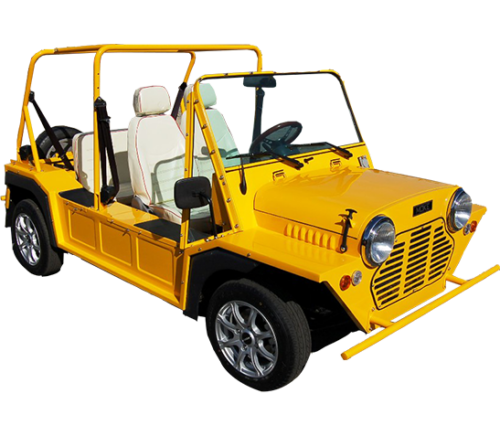 The Refresher Oasis is a smart, fashionably and efficiently built automobile that comes with a mighty 7 HP AC motor and 13.5 HP single cylinder air cooled gasoline engine to provide that extra bit of power. 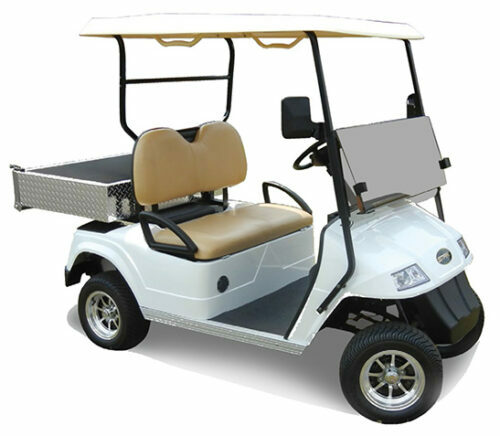 The cart has a modern design and trendy as well as technologically advanced features along with an aluminium beverage storage unit at the back that you can depend upon to keep you refreshed after a long tiring game of golf. The Hauler 1200 is an ultra modern carrier vehicle with a seating capacity of 2 persons and a cargo bed with a load carrying capacity of 800 lbs. 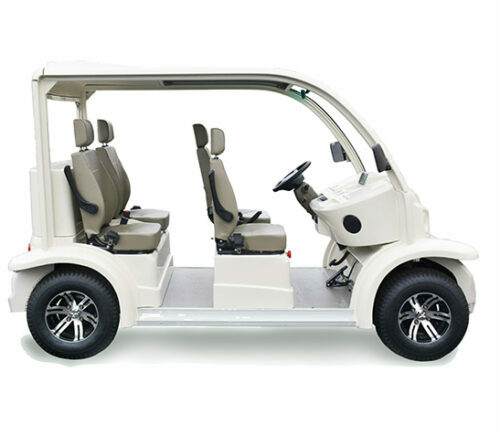 The cart designed by E-Z-GO comes with smart features and accessories such as a rack and pinion steering and hydraulic shock absorbers as well as stylish and comfortable interiors for a smooth ride to and around the golf course. 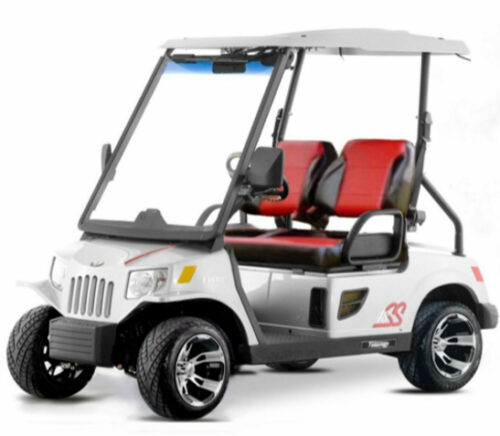 The Hauler 800 is a 2-seater utility vehicle built by E-Z-GO that comes with a powerful engine and an advance braking and suspension system to give you a comfortable ride to the course. The Hauler 800 is designed keeping in mind space, style, comfort and technology. 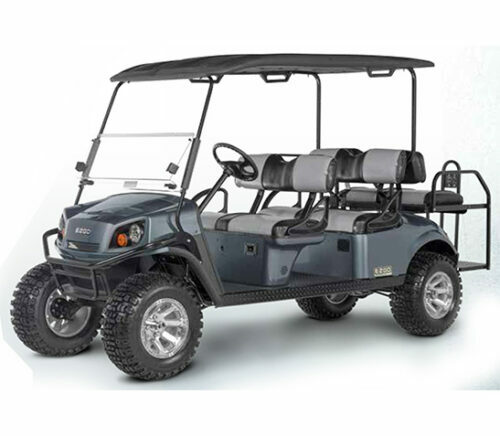 The customized accessories and features that the cart provides as well the large cargo box at the back to carry your luggage makes the Hauler 800 an excellent utility vehicle to travel in. 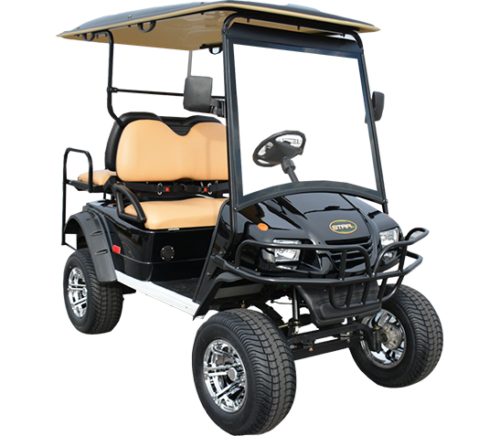 The Gem e2 is a compact yet comfortably designed automobile by POLARIS that comes with a mighty 6.7 HP AC motor that allows it to reach a top speed of 25 mph. The comfortable bucket seats as well as the spacious interiors of the car provide ample space to stretch your limbs without ever letting you feel cramped at point of your drive. The smart modern features of the Gem e2 provide a relaxing and refreshing experience every time you go out for a ride in the car, be it to the golf course or the market. The Gem em 1400 has been built with a rugged, sturdy yet smart and modern design that will draw attention wherever you go. The powerful engine allows it easy manoeuvrability through any terrain while its state-of-the-art suspension and braking system makes your drive a pleasantly fun experience. 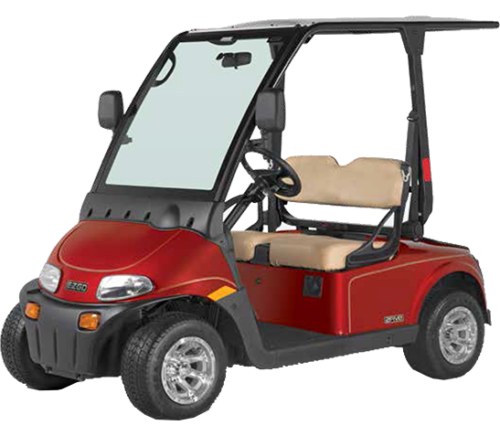 The Gem em 1400 has an impressive payload capacity of 1250 lbs while its efficient 48V battery systems allow you to travel up to 45 miles on a single charge. 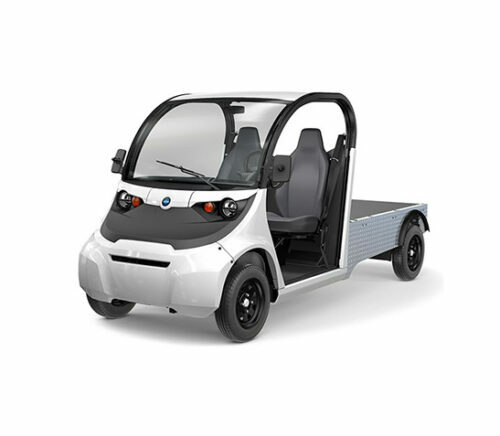 The Gem em 1400 with Box Sides is a 2-seater cargo carrier designed by POLARIS that comes equipped with a powerful 7 HP AC motor, allowing it to reach a top speed of 19 mph. The efficiently and fashionably built carrier has a host of modern features and accessories that lets you transport your cargo in comfort and style. It comes with an impressive payload capacity of 1400 lbs and an option of a steel flat bed to help you carry around your luggage with you wherever you go.